Is a new romance blossoming? Amber Rose and Val Chmerkovskiy sparked dating rumors as they stepped out holding hands in Los Angeles on Friday, December 9. The model, 33, and the Dancing With the Stars pro, 30, were spotted arriving at West Hollywood hot spot Delilah for a dinner date. She showed off her curvaceous figure in a black velvet playsuit and over-the-knee black boots, while he donned a black button-down shirt, black pants and red sneakers. Rose, who competed on season 23 of DWTS with Val&apos;s brother, Maksim Chmerkovskiy, earlier this year, appeared to be in high spirits and was photographed smiling as she entered the restaurant. A source tells Us Weekly that the rumored couple were initially "just friends, but it&apos;s recently turned into more and they have been hooking up." A source close to Val, meanwhile, denies the romance and says, "They are just friends." Last month, the Ukrainian hunk shared a naked Instagram photo of himself lounging on a couch with a pillow covering his private parts. Fans later noticed that the Amber Rose Show host commented on the post, writing, "Daddy." 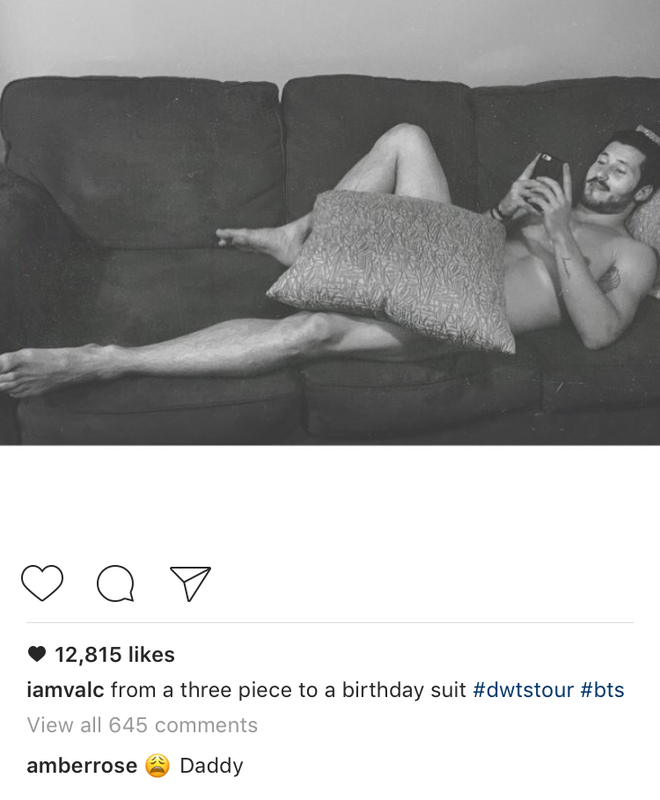 Despite the rumors, Val has played coy in recent months. "I can&apos;t control what people think," he told Entertainment Tonight on October 24 when asked about being linked to Rose, who shares 3-year-old son Sebastian with ex Wiz Khalifa. "I live my life and I try to live it, you know, the way I want to live it." A day earlier, the pro dancer took to Instagram to wish the talk show host a happy birthday, sharing a photo of Rose leaning in to kiss him on the cheek. "HBD MUVA," he wrote. Tell Us: Do you think Rose and Chmerkovskiy are dating?